Hollybeary Creations : That Stinks!!! Happy Wednesday ever~body!!!! I hope your week is going good so far... Today I have a fun card for you using the Stumped set from the Alley Way Stamps. This is a cute set full of Woodland creatures and it goes great with the other sets in this month's release. I stamped the skunk and colored her in with Copics and then I created a Basic Grey card base and added some Pattern papers in Pink Pirouette & Pool Party from Stampin' Up! Then I stamped "Sorry" using the fun Gabfest alphabet set. I followed an older sketch from Sweet Sunday Sketches. To create the Scalloped border I used the Mama Elephant heart border die. And then I added some faux stitching with a white gel pen around the card base and some Pretty Pink Posh Sequins. 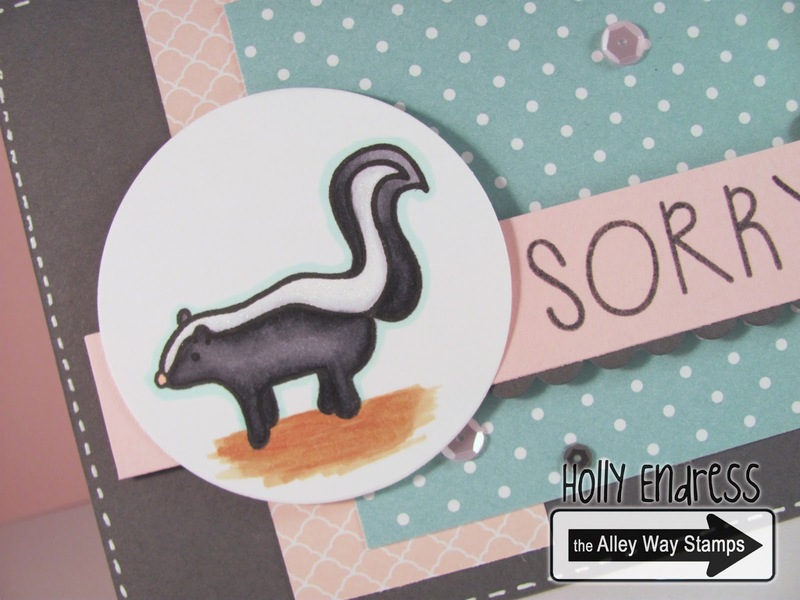 The inside of the cards says " That Stinks"
Be sure to head over to the Alley Way Stamps Blog and see more fun projects created with the February Release.. And don't forget to Link up this month with your Alley Way project for a chance to win!